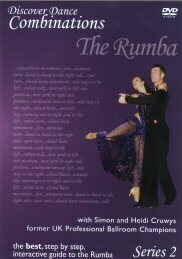 Demonstrated by Simon and Heidi Cruwys, former UK Professional Ballroom Champions. If you liked Discover Dance Ballroom or Discover Dance Latin, you will like Series 2: Discover Dance Combinations even more. There are 6 DVDs in this series that will take you from absolute beginners level to the Bronze medal level. Simon and Heidi will demonstrate each step individually and as a couple. In the same manner they will demonstrate each combination for you. A brief introduction to each dance explains the principles of how to listen to the music and how to stand with your partner. At the end Simon and Heidi dance a professional Rumba demonstration in costumes.